Think about the last time you visited the FAQ section on a website. Why must the map on how to navigate the site be sequestered away from the site itself? Users are often forced to leave whichever page they are looking at in order to track down information somewhere else on your website. And this puts all the burden on your customers, rather than on your website where it should be. Not only must customers leave the page they are looking at to find the information they want. They are often met with pages of gray print that take time to sift through. AnswerDash has provided an answer to this predicament. The company has eliminated the use of ‘help islands’; or separate, standalone pages that are often slapped onto sites with little to no integration into the flow of the information . Rather than being redirected to a separate page, users are able to access a tab on the page itself and search from there. This is the exact opposite of the standard help island formula. As AnswerDash representative Morgan Moretz said in an email interview with Small Business Trends, “AnswerDash is the next generation of website self-service that gives users the right answers, at the right place, at the right time. According to AnswerDash’s own case study (PDF), its tool helps to reduce customer support volumes by up to 50 percent, which means customers are spending more time looking at your product, not an FAQ. Not only do they spend less time searching for answers, but they also spend less time contacting support phone lines, live chat options, or email. (These solutions can be costly or inconvenient for both parties anyway.) By simply accessing a small tab at the top of the page, users are able to access a list of questions and issues giving them information as quickly as possible. Creating a streamlined system is critical to retaining customers on your site. When users encounter problems, they often become frustrated, and negative experiences do not bring about repeat customers. Instead, AnswerDash tried to design its system to minimize reliance on huge Q&A sections or frustrating customer support. Moretz says, “In recognition of most people’s desire to solve their own problems rather than contacting customer support, AnswerDash makes getting self-service answers easy — much easier than FAQs or other help islands. 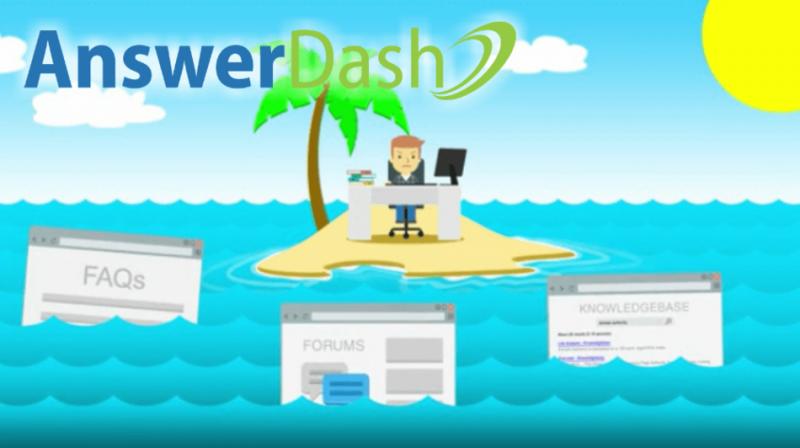 In fact, most customers never need to type a single word when getting answers with AnswerDash since it’s based on the power of point-and-click. Taiwan plans to ask Apple Inc and Alphabet Inc’s Google to pull apps of Uber Technologies available in Taiwan on their app stores, a government official said, upping pressure on the ride-hailing firm that is locked in a dispute with the island. 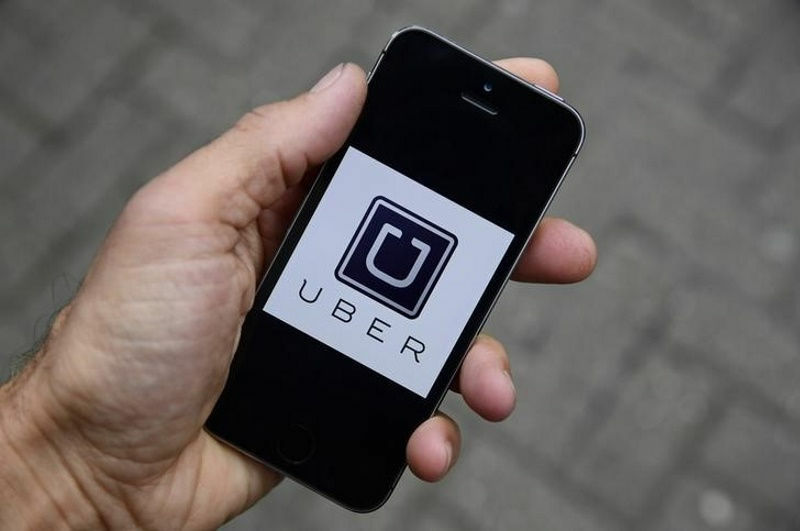 Uber operates in Taiwan as an Internet-based technology platform rather than a transportation company, which Taiwanese authorities have said is a mis-representation of its service and has ordered it to pay back taxes. “Uber has not done what it says it will do, so we are looking at another way by requesting its apps be removed from Apple and Google (app stores),” Liang Guo-guo, a spokesman for Taiwan’s Directorate General of Highways, which is handling the matter, told Reuters by phone on Wednesday. All night on Friday, close to 150 people, mostly Birhor and Gond adivasis, gheraoed the police station at Tamnar block of Raigarh district in Chhattisgarh. They were demanding action against illegal demolitions of 15 houses in Bankheta village, which falls in an area earmarked for a coal mine expansion project. By 3 am on Saturday, the deputy collector and other officials came to meet the villagers. The officials reassured them that their grievances would be heard. Earlier in the day, at 10 am on Friday, however, the police arrived with bulldozers, with the intent of demolishing three houses. 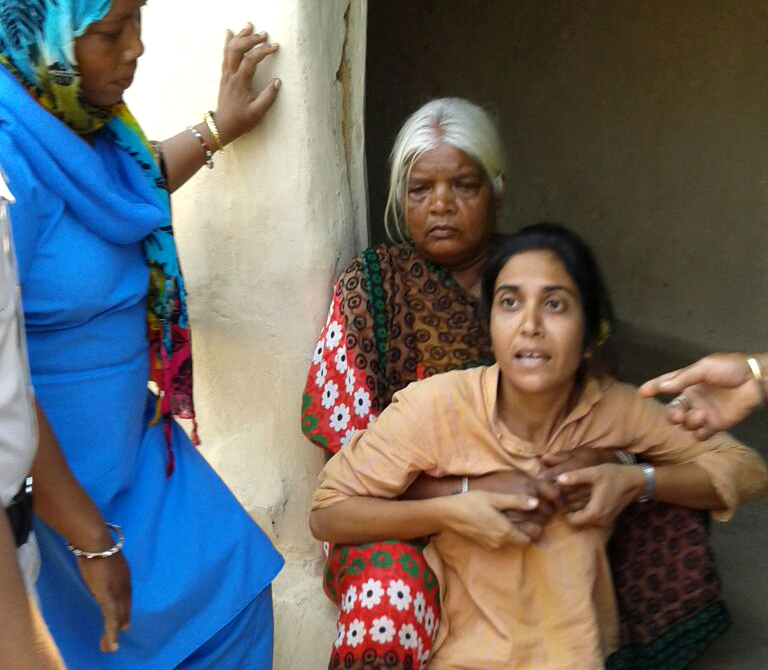 Nirmala Sidar and Sanyaro Birhor, whose houses were the target of the bulldozers, protested against the evictions. They were picked up by the police along with Rinchin, an activist who joined their protest. The three women were charged for obstructing public servants in the discharge of duty and for obscenity under 147, 186, 294 of the Indian Penal Code. Even though all the sections are bailable, the women refused to apply for bail, saying the cases were unfounded. Instead, they asked for the police first information reports to be squashed. “The arrest is illegal and the two sections are completely unfounded,” said Rama Vedula, a lawyer. The bulldozers arrived with the police on Friday morning. 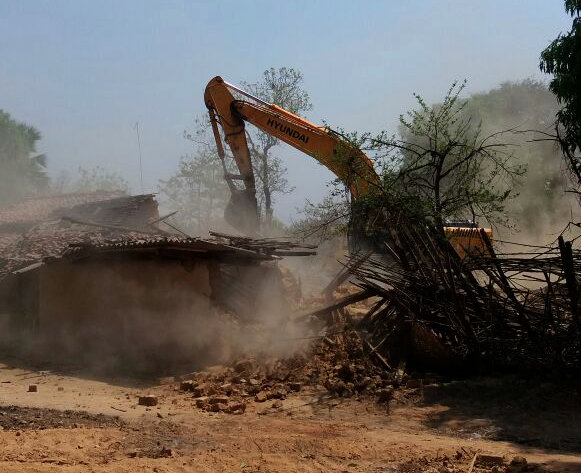 The evictions were to take place for the expansion of the Gare Pelma IV/4 coal mine that lies within the Mand Raigarh coalfields and is operated by Hindalco Industries of the Aditya Birla Group. Initially, these mines had been allocated to Jayaswal Neco Industries, but their lease was cancelled by the Supreme Court in September 2014. The court deemed 214 coal mines allocated between 1993 to 2011 to private players to be arbitrary. Hindalco won the rights to these mines in auctions held last year. According to officials at Hindalco, they have paid the additional compensation. But Birhor disagrees. If they had the right rehabilitation and compensation, why would they not move, she asked. Rinchin is an activist working for the rights of displaced people in Raigarh. The district of Raigarh is protected under the Fifth Schedule of India’s Constitution, with special safeguards around the transfer of indigenous lands. Chhattisgarh’s rehabilitation guidelines state that families, especially those living in districts covered in Fifth Scheduled areas, are eligible for the allocation of alternate land or housing, preferably in the area where they already reside. The protesting villagers of Bankhet are yet to get alternate land or housing. The state revenue department officials claim an eviction notice was issued to the three households on March 22, asking them to vacate their homes by March 30. However, according to the residents, the notice reached them only on the morning of April 1, the day the bulldozers arrived with the police. “While land and environmental permits have been swiftly transferred from one coal mine owner to another, vulnerable adivasi communities are still struggling with issues of legacy compensation and rehabilitation,” said Aruna Chandrashekhar, Business and Human Rights Officer at Amnesty International India, who visited the area last month. Seventeen hours later, the demonstrators seemed to have wrested a tenuous victory. “At least on paper we have won,” said Sanyaro Birhor. After four hours of discussions with the villagers, the administration has agreed to work on their rehabilitation before they demolish their homes. They have also received assurances from the state administration that any complaint on illegal evictions and faulty land acquisition in the Tamnar region would be taken note of immediately. The administration promised to look afresh at the police cases against the three women.